The Arenal volcano is a 1,633 meters (5,300 feet) high mountain, which is perfectly conically shaped with a crater of 140 meters. The Arenal is geologically considered a young volcano and the age is estimated to be less than 3,000 years. It is also known as "Arenal Peak" , "Pan de Azúcar", "The Canaste Volcano", "The Costa Rica", "Río Frío Volcano" or "The Guatusos Peak". The volcano was asleep for hundreds of years and exhibited a single crater at its summit, with minor fumaroles activity, covered by dense vegetation. In 1968 it had an eruption and destroyed the small town of Tabacón. Due to the eruption three more craters were created on the western flanks but only one of them still exist today. Arenal is considered Costa Rica's most active volcano and has been studied by seismologists for many years. Although the activity nowadays is less damaging, you can still see ash columns, underground rumbling, glowing orange lava flows and sudden explosions on a daily base. With its perfect conical shape it allows breathtaking views of volcanic action in the summit. Almost every night the crater offers a spectacle of lights with its explosive eruptions. 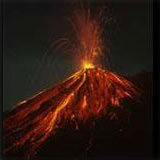 The volcano is located in the northern zone of the country, fifteen kilometers southwest of La Fortuna in San Carlos. The temperature varies from 16 degrees Celsius (60,8 degrees Fahrenheit) in the high areas to 24 degrees Celsius (75,2 degrees Fahrenheit) in the low areas and the annually rainfall is around 5,000 mm (195 inches). The Arenal Volcano area is an important watershed for the Arenal Lake Reservoir. Water from here is used for hydroelectric power, with the purpose of satisfying the electricity demand of the inter-connected national system and the Guanacaste irrigation projects. At about 7:30 a.m. a powerful eruption took place and destroyed the area west of the volcano. A large quantity of impact craters was formed by blocks and bombs of different sizes. Between the 17th and the 21st of June 1975 several glowing avalanches went down from one of the craters. The vegetation along Tabacon River was destroyed and a great amount of material was deposited on the riverbed. Four strong explosions also blew large amounts of ash into the sky. The ash was spread within a distance of 26 kilometers (16 miles). After a period of high effusive activity of intermittent lava flows, a new explosive phase began with 3 to 20 explosions a day of low to moderate magnitude. These explosions of steam, water, gases, and ash reached altitudes of up to 5 kilometers where wind again carried the material across the Arenal reservoir (Lake Arenal) and over the town of Tilarán. A northwest wall of one of the craters collapsed and generated several pyroclastic flows. The collapsed crater wall was shaped as a V and about 60 meters deep and 100 meters wide. In this V-shape the lava started to flow again. Flows started to fill the V-shaped crater and deposited materials around the crater. Arenal Volcano experienced a series of large eruptions on Tuesday afternoon, May 5, 1998. The first eruption was recorded at 1.05 p.m. when part of the northwest wall of the crater fell apart. Large amounts of lava, rock and ash issued from the volcano during this explosion. Another eruption took place at 2.20 p.m. with material emerging from the same part of the volcano. A specialist from the Costa Rica Volcanic and Seismic Observatory explained that the happening is nothing unusual for the volcano. Nevertheless, during this occasion the amount of lava within the crater was significantly greater than normal and therefore more material was distributed. This time there was also a landslide (avalanche) as part of the crater wall fell apart on the northwest side. The phenomenon occurs sporadically, although this time the consequences were greater than usual. As a normal precaution, authorities declared a red alert, closed the road between La Fortuna and Tilarán, which runs around the north side of the volcano, and evacuated approximately 450 people (mostly tourists) from the immediate area including several hotels and tourism oriented businesses. There were no reports of injuries caused by the volcanic activity. At 5.20 p.m. on Tuesday the volcano was still discharging material, but activity had decreased significantly. The eruptions of May 7, 1998 damaged two square kilometers and destroyed a 400 by 100- meter area of green forest in the vicinity of Arenal Volcano. A fissure, 500 meters long and 10 meters deep, was opened up in the wall of the crater and all the material slid down the side of the volcano. During this day there were a total of 23 eruptions, between 1.05 p.m. and 7 p.m. and thereafter the volcano returned to its normal state. Authorities reported no unusual behavior and the national park was reopened the same week. Local seismologists investigate the activity of the volcano and park rangers continue to vigorously enforce the safety perimeter.